Nicole Amsler makes her living as a writer, by writing press releases, magazine articles and web content for business clients. She owns Keylocke Services, a copywriting and marketing consultant firm for small businesses. Her business allows her to write copy for clients from her home office—squeezing in short stories and full-length novels in her spare time. Fiction is her first love—from her first handwritten novel in 2nd grade to her many “drawer novels”—not yet fit for human consumption. 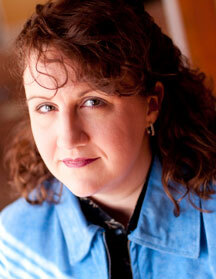 Nicole has published a handful of short stories and is an avid proponent of NaNoWriMo (National Novel Writing Month). She has won NaNo four times, including last year’s novel “Dismantling Spider Webs” about forgiveness. This year’s novel is titled “Zone Trippers” which examines identity. Nicole speaks regularly on editing, the writing process and marketing. She currently lives in Ohio with her family, where she runs a book club, stalks her favorite authors, teaches improv acting to elementary students and seldom sleeps. She can be found on Facebook, Twitter, her personal blog and in the local coffee shop. If you haven't done so already, check out Nicole's award-winning story "Looking for Death" and then return here for a conversation with the author. WOW! : Congratulations on placing in the WOW! Fall 2010 Flash Fiction Contest! How did you begin writing this story, or what was your inspiration for it? Nicole: I’ve had a reoccurring dream for about 30 years. I am standing in my Dad’s backyard and I see a plane crash. Of course, I have never actually seen it happen but it remains very vivid to me. The story started out with a child’s difficulty understanding death and the planting of the body. But as I wrote the first draft, I realized it was the father who was grappling with a pointless death. I kept the son in a longer version but found the story was stronger if it was just Mason’s story. Trying to bring the story down to 750 words ended up crystallizing it. WOW! : We’re glad you’ve had a positive flash fiction writing experience. It’s certainly different than novel writing. What, if anything, did you learn about yourself each time you’ve completed a novel for NaNoWriMo? Nicole: I have completed several and I find it very similar to birthing stories. There are no two experiences alike and the birthing process has no bearing on how your child turns out. My first novel (Holiday Cards) was pure magic—the story flowed, my characters were vivid and well rounded, and I found surprises around every corner. Sadly, though, it was entirely plot free. I still have hope for it though. I just think I need to be a better, wiser writer before I can do it justice. Another year—Dismantling Spider Webs—was a complex, detailed character study. It is completed and is being work-shopped but I know it is still missing something. This year’s NaNo novel was pure inspiration. I imagined the catalyst act in about two minutes and suddenly I had a whole book. It has been a rollercoaster, trying to write outside of my genre about topics I don’t understand but I embraced the NaNo challenge of just getting words on paper. I consider this year’s book—Zone Trippers—to be more about discovery writing than even a first draft. I have high hopes for this book but it realistically has a full year of revisions before I will have a readable version. WOW! : Good luck with the revisions! How do you balance your time writing for your business and writing for pleasure or other purposes? Nicole: Not well—if you want the honest answer. I work from home and my kids are in school all day so I have 6-1/2 hours to write client copy as well as any revisions or short fiction I want to hammer out. It’s amazing to see how fast the time can evaporate. I am a terrible procrastinator and I have to trick myself to get the words flowing. I live by Write or Die as well as my egg timer. I have one computer with no internet connection so I can work without temptation. I also switch modalities—if I have stared at the computer screen for hours with no result, I will switch to paper and pen. Balancing the two—writing that pays and writing that doesn’t—will probably always be a struggle. I will continue to strive towards balance. WOW! : A computer with no Internet connection…great idea! I think I need one of those. What do you enjoy most about writing? Nicole: I enjoy writing for a living because it leaves me with a very flexible schedule, so I can attend field trips, school parties and have lunch with my husband. I enjoy fiction writing because I can get lost in my own worlds. I have only recently begun sharing my work so to get compliments or comments is amazing to me. To realize that your words have been read, pondered or discussed is humbling. It makes me want to be a better writer. There is also something very satisfying about printing out my book and seeing it as a tangible product. I can only imagine the joy of seeing it printed and bound on a book shelf. WOW! : If you could have dinner with one author, dead or alive, who would you choose and why? Nicole: I will be liberal with my definition of author and say Joss Whedon, the TV and movie writer (Buffy the Vampire Slayer, Angel, Firefly, Dollhouse, Dr. Horrible’s Sing Along Blog, Toy Story, etc.) He writes all the scripts and creates the worlds so I am going to firmly place him in the writer camp. I love his brilliant use of back story, his quirky but believable characters, his rewording of clichés and how he always—always—breaks your heart. By writing a character who is believable and dynamic, you hold the power of emotional resonance. I have found screenwriting books and classes to be tremendously helpful to the writing process as well. So who better than to lunch with than a brilliant screen writer? WOW! : Thank you, Nicole for your insightful answers to our questions! Best of luck with your writing! I loved the story! You have a way with description and metaphor. Can't wait to read your full length novels! Great story! Can't wait to see more of your work when they're published!